In general, I like my clothes to last me more than a season. I want to wear them for a couple years, at least! Maternity is frustrating to me because even if I have another child, all it takes is the next pregnancy to be in a different season and I can’t really use the same clothing again. Or if there is a 4 or 5 year gap, things go out of date. What with a healthy pregnancy weight gain, and a dramatically different body shape, keeping on wearing my everyday clothing isn’t a good option either. 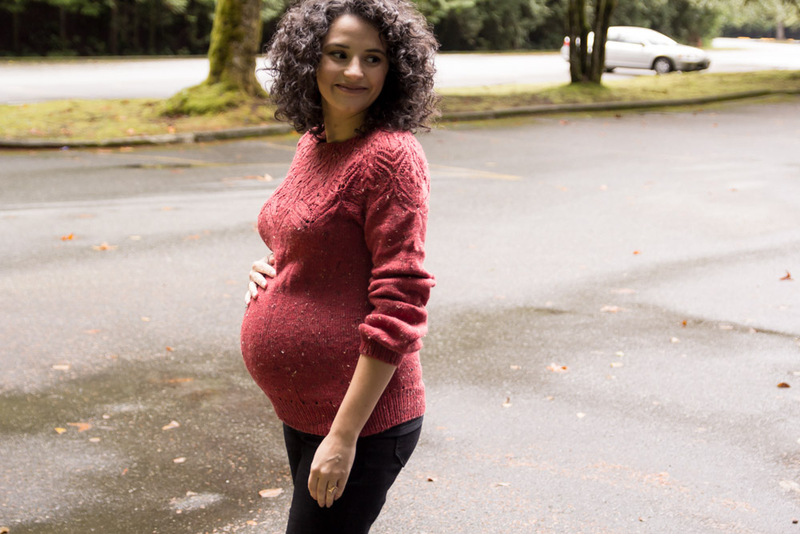 So, in light of that, here are my thoughts on knitting sweaters that will do double duty as non maternity, maternity, and be kind to your postpartum body as well! The rare pieces of clothing that stick with you through it all are the best, and if you are hand-knitting a sweater, you will want to wear it for more than 3 months. A number of my circular yoke patterns have a “swing” or “a-line” body option. This option is a bit longer than the other ones, and accommodates a belly beautifully with no adjustments. I have yet to wear one of mine postpartum, but they are favorites of mine pregnant or not. These include the Geo Lace, the Bloom Tee, and Leafy Lace. Another surprisingly effective trick to to pick a sweater with no shaping in the body (like the straight body option in Geo Lace, Bloom Tee, or twist sweater) and then choose a yarn that the ball band recommends being knit at a somewhat tighter gauge than the pattern (so if the pattern recommends the gauge being 5 sts to 1 inch, pick a yarn that suggests being worked at 5.5 to 6 sts to 1 inch). Work the sweater up at the pattern gauge, and you will find that the resulting sweater is extra-stretchy! Please do note that you will want to err on making the next size up rather than down, and this will work best on longer length sweaters. But, since there is no body shaping, it is usually easy to add a couple inches to the body if need be. Cardigans are a classic “safe” choice. I wear all my regular cardis through pregnancy, and simply accept that there is no way they can button over my belly. I just wear them open. If you want yours to close over your belly, two options come to mind. You can choose a design that closes just under the bust (like my Belt Cardi) and err on the side of picking a too-big size, or you can choose a design with an overlapping front that gives some extra room (like my November Cardi). When in doubt, make the next size up. Even if you are careful to keep your pregnancy weight gain on the lower side, you will still find yourself 15 lbs + heavier after baby is born, and likely a couple bra cup sizes up as well. Or just make a cardigan. The key place to allow room for growth is the arms. As above, with the weight gain your arms are likely to grow a bit as well. However, your shoulder/back width shouldn’t change too dramatically for a knit sweater to handle, so if you don’t mind not doing up cardigans, they fit beautifully.